25 years later, two pledges from the same fraternity break into the asylum so that they can take their picture with Father Malius. Why? Because people are dumb. Of course, as soon as they take their picture, Father Malius wakes up and goes on a rampage. Armed with a pickax and an endless supply of one-liners that even Freddy Krueger would have turned down, Father Malius heads back to the fraternity. Also returning to the frat is retired Detective Henry Collins (who is now played by a clearly slumming Darren McGavin). When I was growing up in the 90s, Happy Hell Night used to be a mainstay on late night HBO. It’s a typical straight-to-video slasher, distinguished only be a few familiar faces in the cast and a decently scary murderer. With his pale skin and his gaunt appearance, Malius looks like Nosferatu in a priest’s collar. Charles Cragin has a perfect thousand-yard stare for the role. 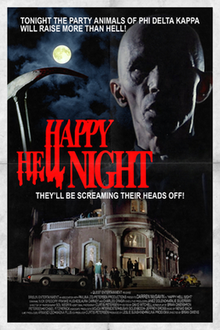 It’s just too bad that Happy Hell Night was made at the time when every killer had to be a comedian because most of Malius’s one-liners feel out of place for a Satanist who has spent the last 25 years locked away in an asylum. As for the familiar faces, Happy Hell Night not only features future Oscar winner Sam Rockwell in a small role but also CSI’s Jorja Fox , who shows up just long enough to get hit in the head with a pickax. When the movie was released, Darren McGavin was the best-known member of the cast. He has about five minutes of screen time and overacts his death scene like a real pro.